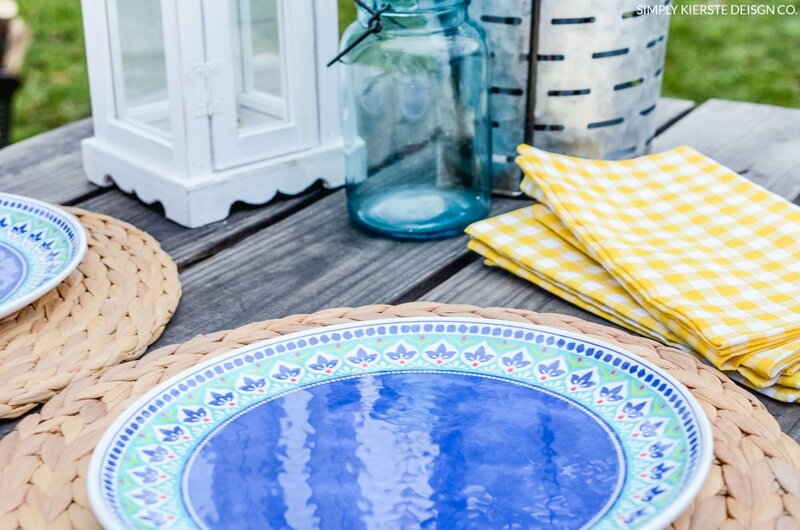 Spring is just right around the corner here, and I’m already dreaming of summer nights on our back patio—friends and family around the table, eating yummy food, watching the kids play, and enjoying the fireflies light the dark night. We just moved in this past fall, so this will be our first year of summer entertaining at Old Salt Farm, and I can’t wait! 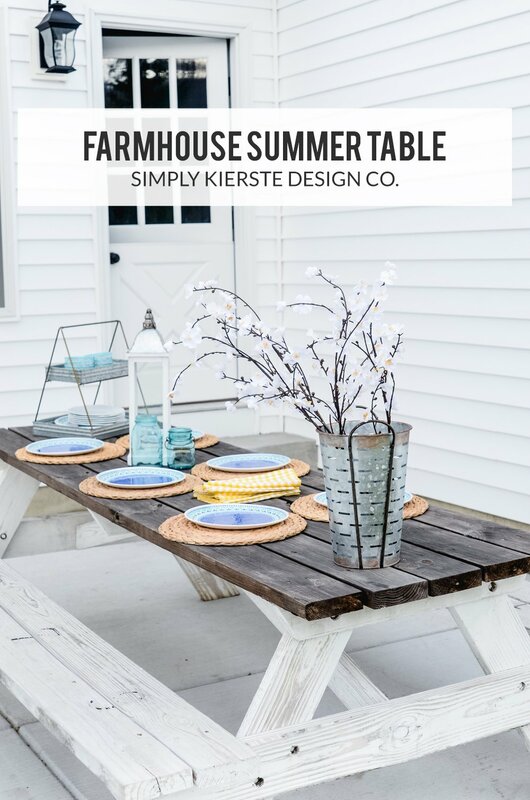 I created a simple Farmhouse Summer Table with some really fun summer dishes, and utilized all of my favorite galvanized serving pieces. Now…we’re ready for our first guests! I love a beautiful table, but I also like it to be simple. I want to be able to put it together in a few minutes, but have it look homey and comfortable for my guests. 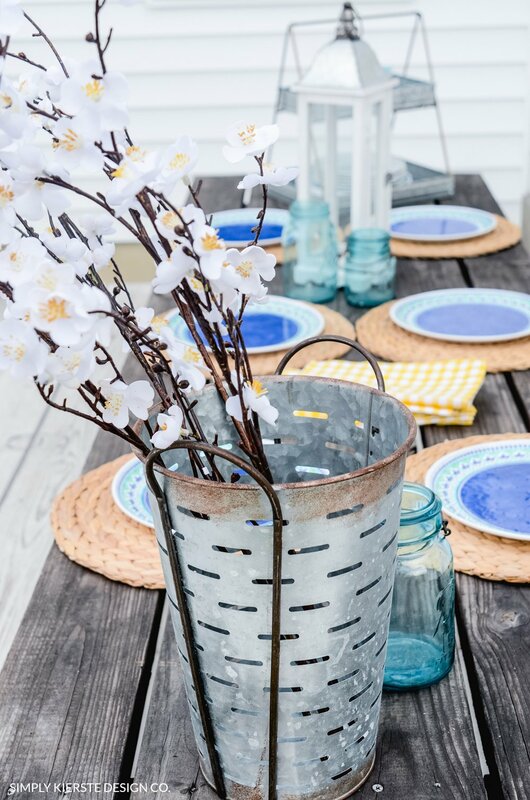 A white lantern, a few vintage blue mason jars, and a galvanized bucket filled with flowers were the perfect touches on the table, in addition to the darling melamine dishes. As the mom of six kids (five of them are 10 and under) I’m a huge fan of melamine dishes. They’re kid-friendly and much less likely to break, but nicer than paper plates. Don’t get me wrong, we definitely use our fair share of paper plates, but sometimes it’s nice to “fancy” it up, without getting fancy. 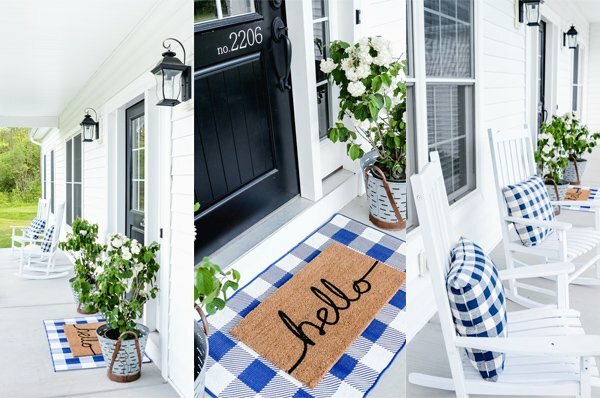 A big thanks to Better Homes & Gardens for sponsoring this post! All opinions about their adorable product are 100% mine. I usually use white dishes, but in the summer I like to to mix them with bold pops of color. 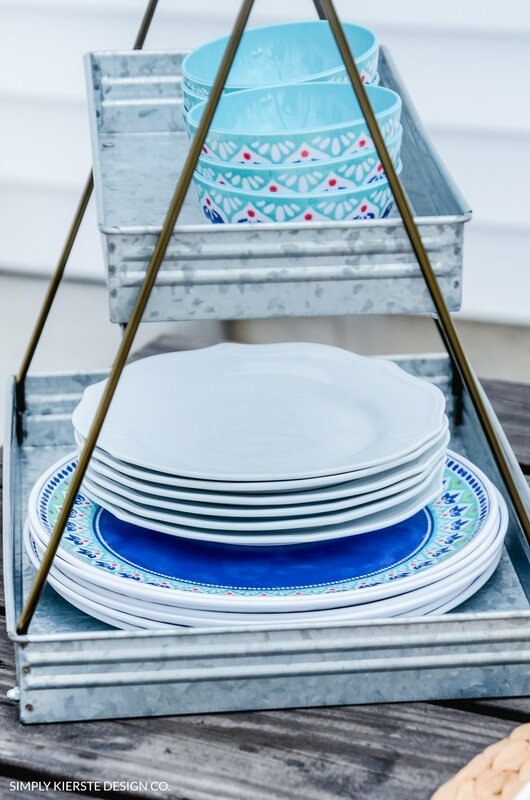 I’m in love these blue plates, and they’re so fun mixed with farmhouse style gingham napkins. 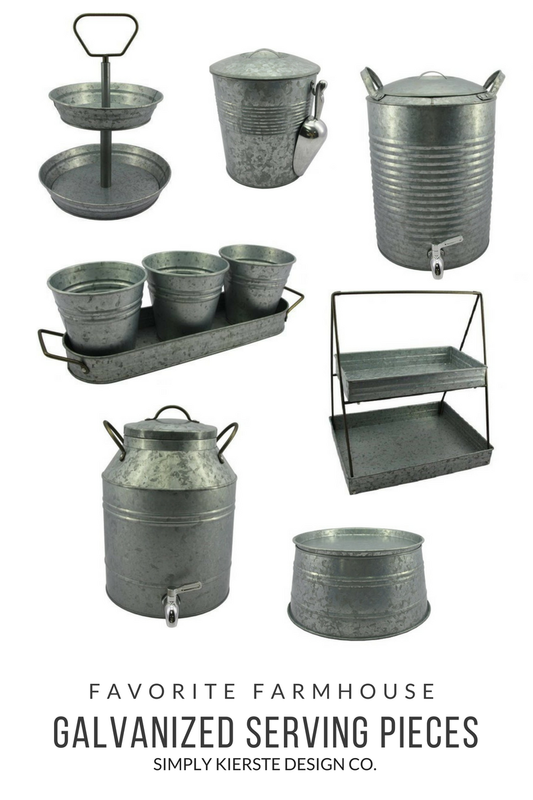 Galvanized serving pieces are my favorite way to add a little farmhouse charm, and Better Homes & Gardens at Walmart has the most adorable and very reasonably priced pieces that have quickly become my favorites. They’ll be perfect for not only spring and summer, but the whole year! How cute is this rectangular serving tray? I’m using them to hold extra dishes, but the sky is the limit. 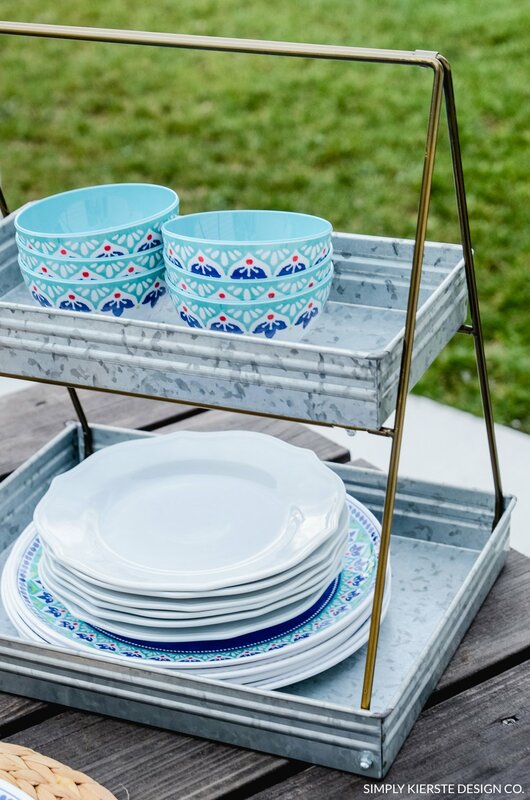 It’s perfect for serving food, serveware, and SO much more. I made a vintage lemonade stand a few years ago, with a reversible chalkboard sign, and I LOVE using it on the back patio as a serving stand. I loaded it up with a serving caddy for my tableware, along with beverage and ice dispensers and the cutest round 2-tiered serving stand. Isn’t this beverage dispenser the CUTEST? It holds 3 gallons, and it’s less than $15. Love. This darling ice bucket is insulated inside, and comes with the cutest scoop that hangs on the side. So practical and adorable! When I first saw this serving caddy, I fell madly, deeply, in love. The pails are good-sized, fit quite a bit inside them, and add the cutest touch to the table. And for less than $10! Woot! I filled the round serving stand with lemons to bring in some color, but how adorable would it be as a dessert stand? I plan to pile on all the fixings for S’mores and put it on the table by our campfire. 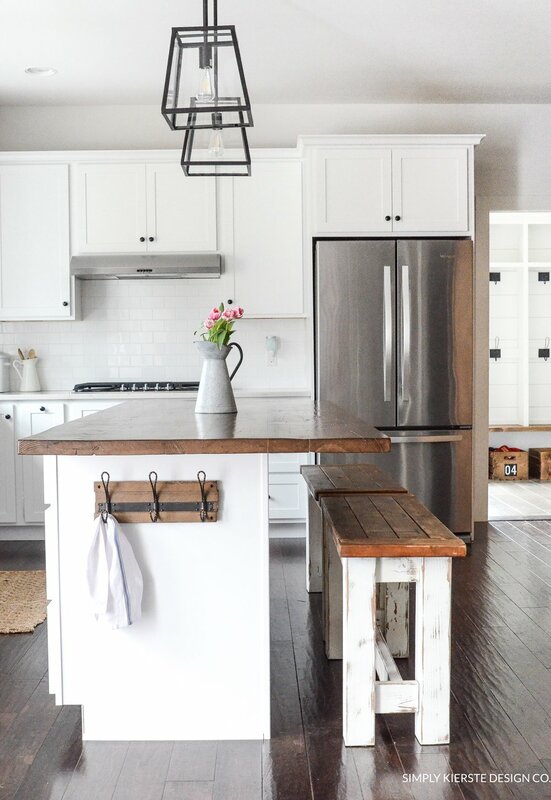 For more Farmhouse Style at Old Salt Farm, check out these posts!